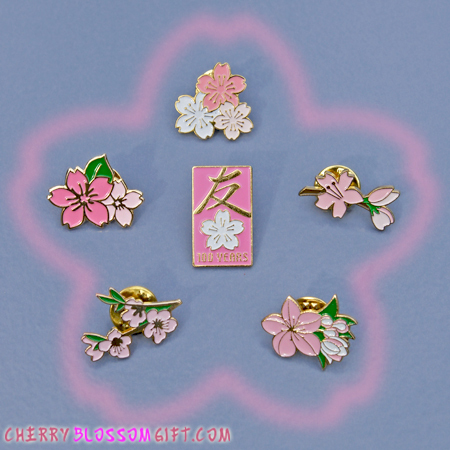 Order your Official National Cherry Blossom Lapel Pin today. We carry previous years, but supplies are limited. 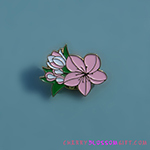 This is the National Cherry Blossom Festival Collectible Floral Lapel Pin. This is the official National Cherry Blossom Festival pin. Every year a new the committee selects a new design and produces a limited amount of pins to celebrate the festival. The Official 2017 National Cherry Blossom Festival Pin was created by designer, Lawrence Atoigue. This futuristic pin features sharp, triangular flowers that blend pop and cubism art styles. The Official 2016 National Cherry Blossom Festival .. 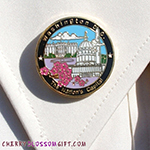 The Cherry Blossom Gift Shop presents The Official 2016 National Cherry Blossom Festival Lapel Pin. 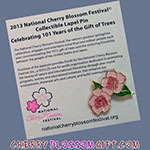 Add to your Official Cherry Blossom Festival pin collection with the 2012 Cherry Blossom Festival Centennial Lapel Pin presented on a card containing information about the Festival. 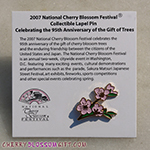 The Official 2008 National Cherry Blossom Festival pin celebrates the 96th anniversary of the gift of 3000 Yoshino Cherry trees from Japan planted around the Tidal Basin in Washington, DC, and the enduring friendship between the citizens of the United States and Japan. 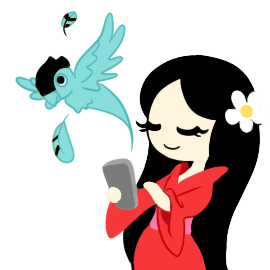 The 2007 National Cherry Blossom Festival celebrates the 95th anniversary of the gift of cherry blossom trees and the enduring friendship between the citizens of the United States and Japan. The Washington DC - A Nation's Capital Pin is a beautiful collectible that highlights some of the most famous landmarks in our Nation's Capital. Celebrating the 97th anniversary of the Japanese gift of Yoshino cherry trees to the United States, the 2009 Official National Cherry Blossom lapel pin features two different cherry blossoms in bloom and a green leaf on top. 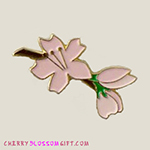 Each year the National Cherry Blossom Festival comes out with an official cherry blossom pin to celebrate its festival. 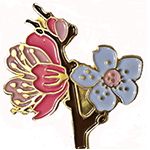 The 2010 pin features three cherry blossoms in different stages of bloom. Pin is gold colored with pink and green enamel with "2010" embossed on the back. 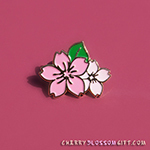 The newest edition to our official Cherry Blossom Festival pin collection, the 2013 Cherry Blossom Festival Lapel Pin showcases the beautiful budding of these magnificent trees and celebrates the 101st year these trees were given to our country.